We are back with another week of the Style Perspectives, this time styling graphic tees. I’m relatively new to “styling” graphic tees. Usually they’re just what I throw on when I want to be casual and comfy. Below is a new tee that we were gifted by Chicos at the BAM Conference. To make this a more styled look, I added a fun, blingy necklace and wedge heels. If it were cool out (but it’s not! The weather has been PERFECT!) I could add a denim jacket, a military jacket or a bright cardigan. Isn’t that a fun tee? Want a chance to win your own? 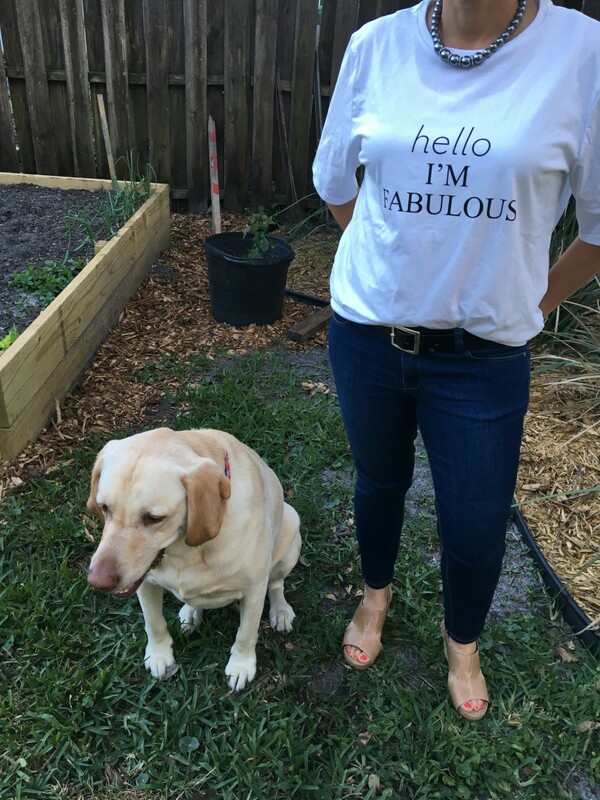 Keep reading to the bottom to enter a drawing for a size XS Hello I’m Fabulous tee (these run big, I’m wearing a size M and it’s quite loose on me! ), plus a leopard print bag and cute sunglasses! It’s summer in a bag! Penny wanted in on the fun. Doesn’t she look thrilled? She was getting bored… Sorry Penny! Don’t let us keep you from your nap! Then I styled this tee which I love because I say this all the time. “Ciao bella! !” I added a necklace of colorful beads made by women at risk. I love it when I can purchase something that I like that also supports a good cause. By now you probably know that you can join us! 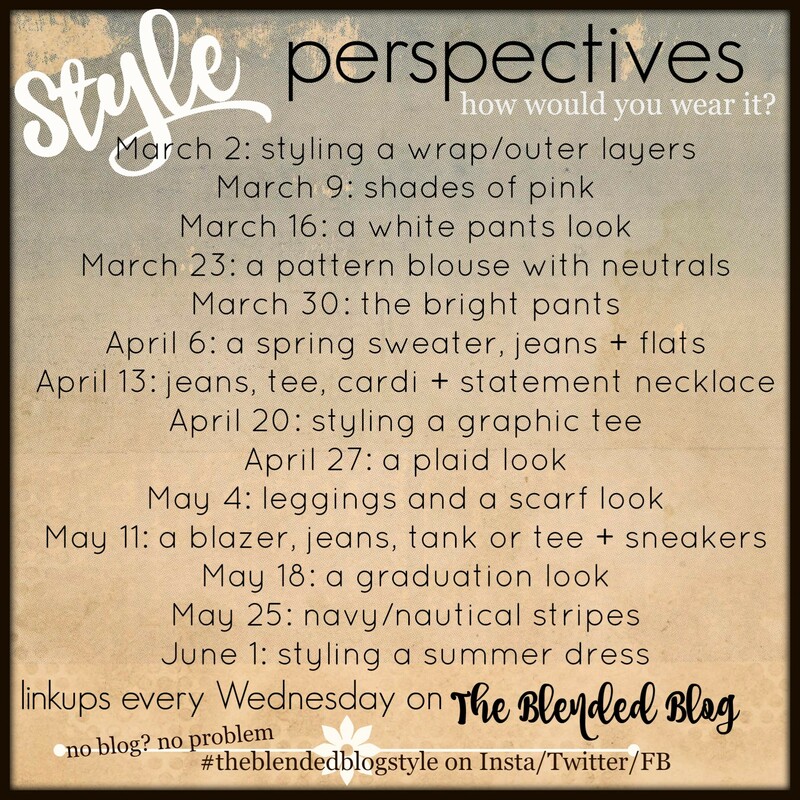 Link up on the Blended Blog or show us your outfits on social media using the appropriate hashtag! Be sure to check out our Shoe Hoarding French Teacher (whom I got to meet IRL!) to see what she did. (She wore a great tee in Las Vegas! I wanted it. It was grammar related. I love grammar tees.) She had a request from us and I’m so curious to see what she had up her sleeve! And be sure to enter the drawing in the rafflecopter below! Edited to add: Check out how great everyone looked last week in their cardigan+tee+necklaces combo! 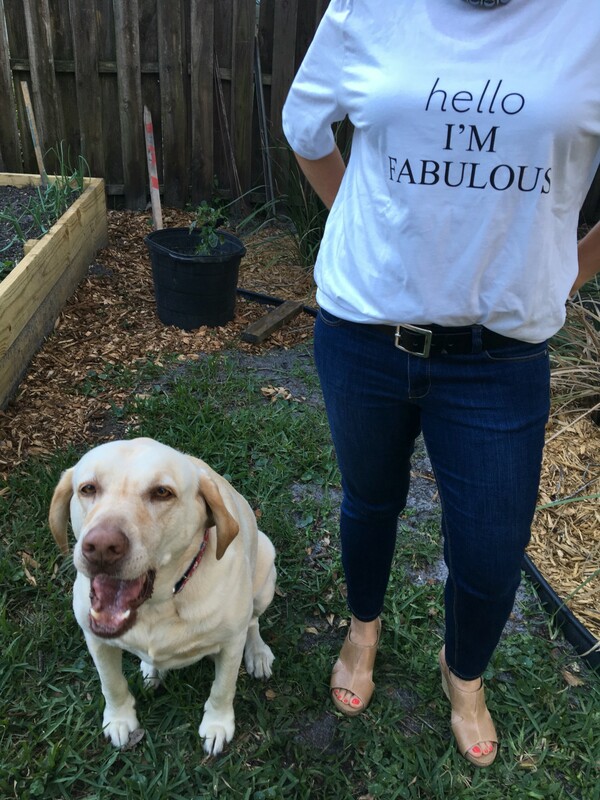 You look so stylish in your tee (and fabulous)! I like your wedge sandals. Love the tees but I really really love the peep toe shoes! I love that you guys all have the same shirt, and different looks. That beaded necklace with the Ciao Bella shirt is really pretty! Thanks Nicole! We certainly didn’t plan that! But when you have a new something, you just wanna share it, kwim?? Oh loving that everyone styled their I’m Fabulous Tee, I should have thought of that, oop! You look great! Love those shoes too, I don’t have anything that color or that style…I think I need to go hunt down a pair. LOVE those shoes and holy happy doggy!! Look at that smile, must be happy to have momma home!! She’s so funny like that. She actually does smile! You are a doll!! Loving those Pearls with that tee and how great is yellow on you!! Peep toe shoe majorly pretty pair for sure!! Love!! It’s funny but I don’t wear a lot of yellow. Probably because of my olive skin tone. But I like this tee too much to care! Ha! Two great tees! Love them with the blingy necklaces – and I agree, the shoes are great! They need to be broken in still. I had to change out of them after a couple of hours because they were giving me blisters on the TOPS of my toes! But I hope that goes away with some wears. I do think they are cute! Good gravy, you look muy bella in your yellow tee, and the white one, too. But that yellow. That yellow!!! 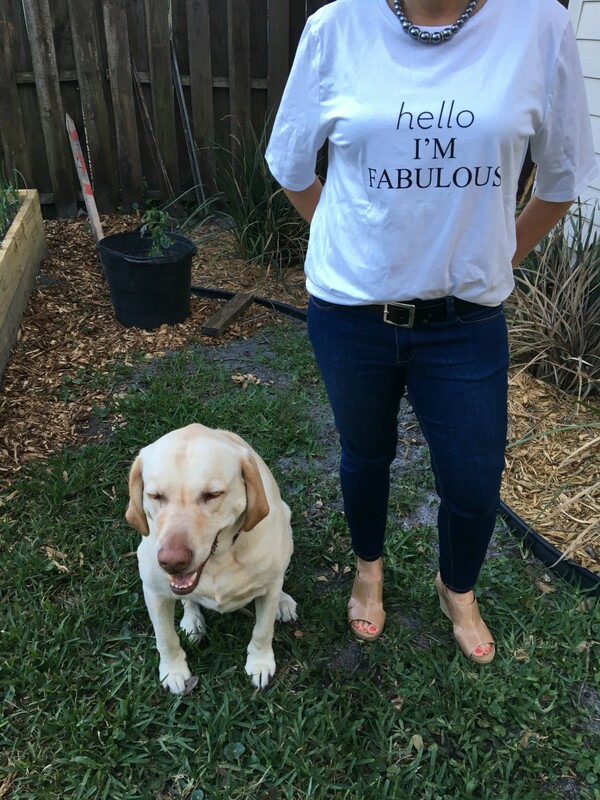 You and your fur baby do indeed fabulous. I love the message of the Chico’s tee! 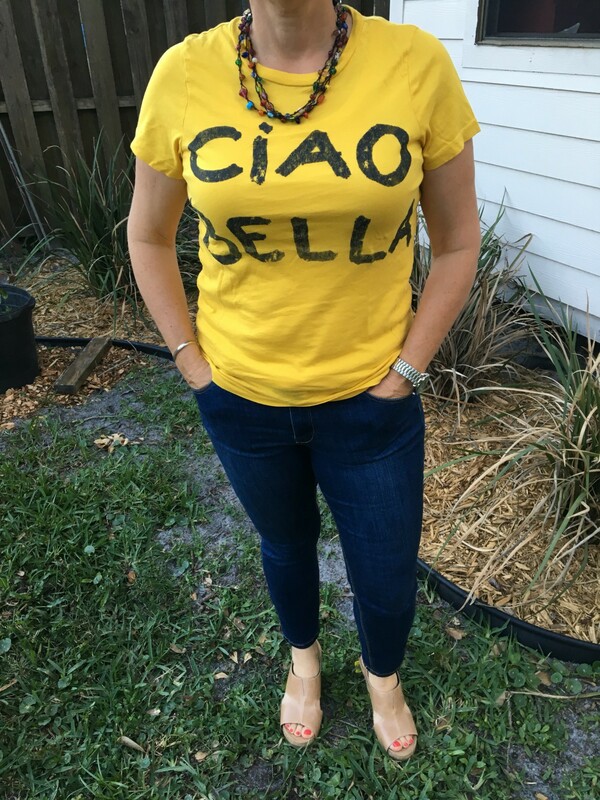 And the Ciao bella tee is great! Love the color, the message, and the necklace you are wearing with it! Why thank you Andrea! What a nice thing to say! Hello Fabulous! The bright yellow graphic is perfect for this time of year and love the necklace w/a purpose! Thanks Carrie! I do love when I wear things that help others! Aww, your dog is too cute! I ended up wearing my Fabulous tee on the flight home. It was perfect for that! Hi Sheila. 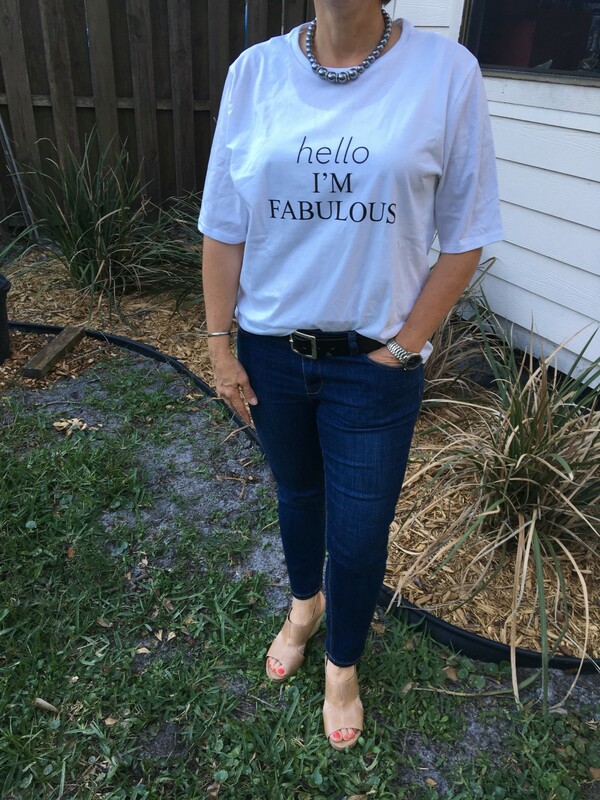 That “I am Fabulous” tee and the “Ciao Bella” tee are both fabulous (such awesome messages on them too) as are the tan open-toe booties – fabulous! I am horrible at link ups! But I’ll try to remember to link up! 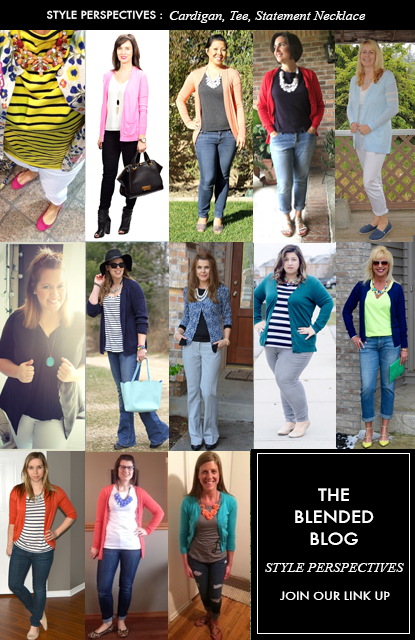 Thanks for inviting me, for joining the Blended Bloggers and for stopping by here! Thanks Manda! And thanks for stopping by!